You know those amazing Tumi luggage pieces you’ve seen your fellow passengers whisk off the baggage claim carousels? Well, we’ve been eyeing them for years and now the infamous brand is delivering the same envious style in our favorite accessory – eyewear! Giving us reason to actually look forward to winter, Tumi’s sunglasses will be available in January and will be followed-up by optical frames in March. Bragging rights are certainly in order based on the looks of these frames. Bold details add invaluable flair to Tumi’s breakout collection and feature genuine leather, textured materials, flex double hinges, silicone “rings of Saturn” temple tips (for style and grip) and acid-etched stainless steel designs. While unique touches – like cleverly naming sun styles after famous bridges around the world, providing exclusive Tumi ZR3 polarized lenses developed by Carl Zeiss Vision and offering photochromic fold-and-lock reading glasses – reflect Tumi’s dedication to innovative thinking and superior technology. 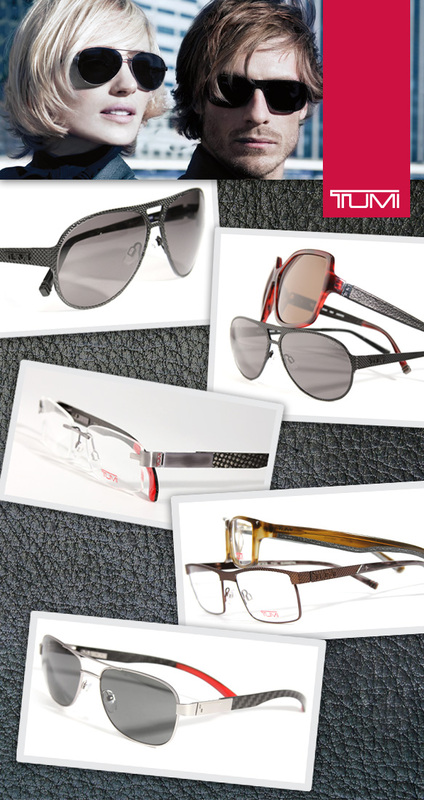 Overall, Tumi Eyewear has created the perfect fusion of brains and beauty. Their specs and shades stay one step ahead of technology yet they remain on the forefront of all things fashion. That’s a hard combination to beat, so we suggest putting these frames on your wish list!